On July 28, 1885 U. S. Patent Number 322, 991 was granted to Frank L. Stowell of New York City for his "Knife Eraser." 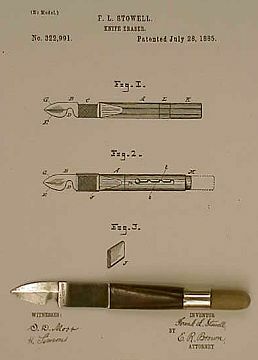 Stowell's tool included a sharp edge for pen making or general cutting (G), an ink eraser edge (E), a notch used for pencil sharpening (D), a file surface for sharpening the lead of a pencil (C), a handle (A), and an eraser to be fitted at the end of the handle (K). Stowell suggested the handle could be made of "wood, hard rubber, ivory, celluloid, or any other suitable material." Two examples have been documented with wood handles. Although the patent does not mention a corkscrew, both documented examples contain a corkscrew accessed by unthreading a wood plug in the eraser end from the worm. The corkscrew would be used for opening an ink bottle. The Museum example is marked PAT. APPLIED FOR. Fred O'Learys Corkscrews: 1000 Patented Ways to Open a Bottle pictures an example marked PAT JULY 28. 85. Neither one has the rubber sleeve to protect the file and on both the file is wider than shown in the patent. Stowell's intention for the rubber sleeve was "to prevent dropping of the lead-powder on the paper, and also to prevent soiling of the fingers when the instrument is used for cutting, sharpening, or erasing..." He also suggests that "the entire blade and part of the handle may be covered...by a sheath similar to that used for an ordinary eraser." Stowell submitted his patent claim June 19, 1884.